One day, Larissa Winters, a City Connects coordinator, was on Instagram, and she typed the term #kind into the search box. She was looking for a way to engage students with positive aspects of social media. What came up in her search was the Kind Campaign, a nonprofit organization that addressed girl-on-girl bullying. For Winters, the campaign offered a chance to pull troubling behavior into the light, where it could be discussed and dealt with. So, she contacted the Kind Campaign and used their materials – a documentary called “Finding Kind,” and a related curriculum – to run an all-girl assembly on bullying at her school, Saint John Paul II Catholic Academy. It’s a pre-K through eighth grade school in Dorchester, where she is the school counselor and the City Connects coordinator. Winters work covers a lot of ground. In addition to connecting students to tailored sets of school and community resources, she focuses on improving students’ social emotional skills and works with faculty and administrators to improve school climate. That’s why Winters was excited when, a few months later, she found out that she could apply for the chance to have the campaign founders visit for a second assembly. Those founders, Lauren Paul and Molly Thompson, had both experienced bullying. Winters applied, and her school was one of the 40 out of 500 applications chosen. The results were inspiring. As the campaign’s founders, Lauren Paul and Molly Thompson, came to the assembly and shared their own stories. After meeting in college, Molly, Lauren, and their moms traveled across the country to interview people for the documentary. For Larissa Winters’ students, the assemblies were a chance to be honest and vulnerable. 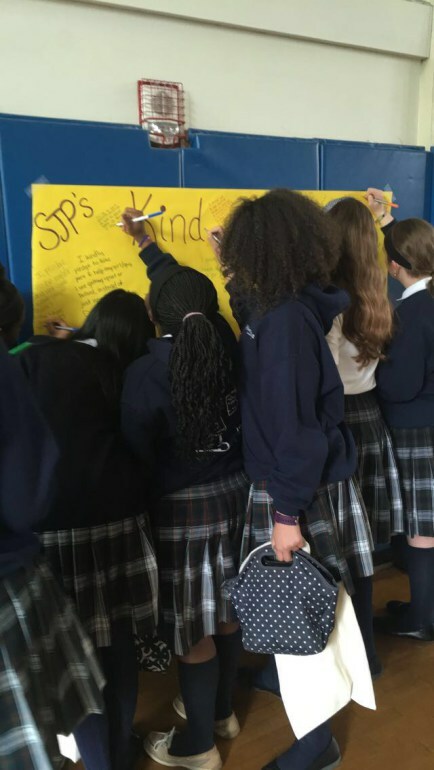 Girls who participated wrote Kind pledges to themselves – promising to do simple but effective things such as smile more at strangers and think before speaking. The girls also wrote Kind apologies to anyone – a peer, parent, teacher, or someone else – whom they felt they had wronged. “The apologies were just fantastic: the way that the girls were able to take responsibility for some of their actions. A lot of it was things that we had seen and worked with, but hearing them take the mic and apologize to some of their classmates for something they did — having them verbalize it and internalize it – was really powerful for them,” Winters said. Some girls apologized to a fellow classmate for not being more socially accepting. The girls also talked about how being a bystander is just as bad if you’re not helping someone who is being bullying, that’s hurtful. Even Paul and Thompson, the campaign’s founders, talked about times when they were bystanders and how they now wished that they had spoken up instead. Winters wrote about the event on her blog. Winters hopes the girls will carry their Kind skills with them to high school and beyond. What’s next? Winters says she wants to find an anti-bullying curriculum for boys.